52-page giant. Cover pencils by Curt Swan, inks by Murphy Anderson. "The Hero Superman Doomed to Die! 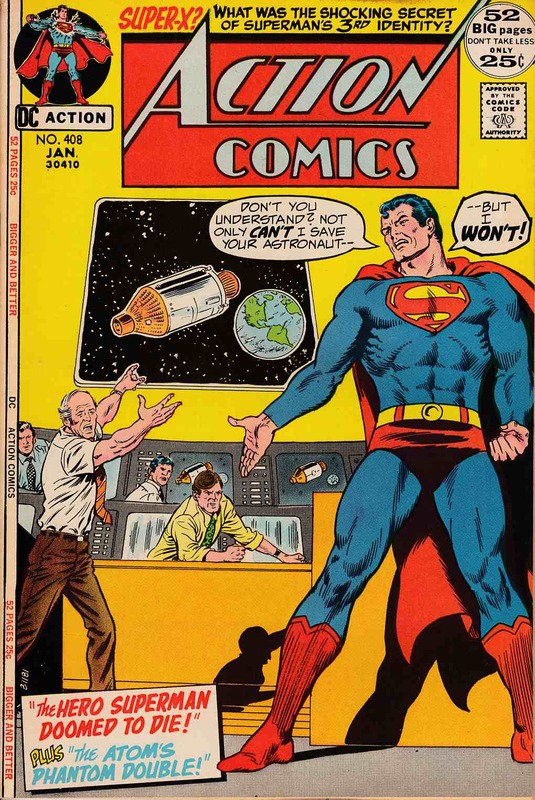 ", script by Cary Bates, pencils by Curt Swan, inks by Murphy Anderson; Superman finds himself unable to rescue a stranded astronaut. "The Shocking Secret of Super-X! ", script by Cary Bates, pencils by Curt Swan, inks by Murphy Anderson; Superman creates a new identity to prevent contaminating earth with a strain of artificial bacteria. Classic reprint, "The Atom's Phantom Double! ", script by Gardner Fox, pencils by Gil Kane, inks by Murphy Anderson; A laboratory accident creates a ghostly duplicate of Ray Palmer, who wants to take the real Ray's place by destroying him. *Grading Notes: slight foxing along edge of back cover.